Like Big Stone Arts Council on Facebook! WELCOME LuLaRoe Consultant, Jennifer Nordly, as the newest Chamber member. The weather was not looking good before the Lake Days activities started last night… but all cleared and we had an awesome evening! 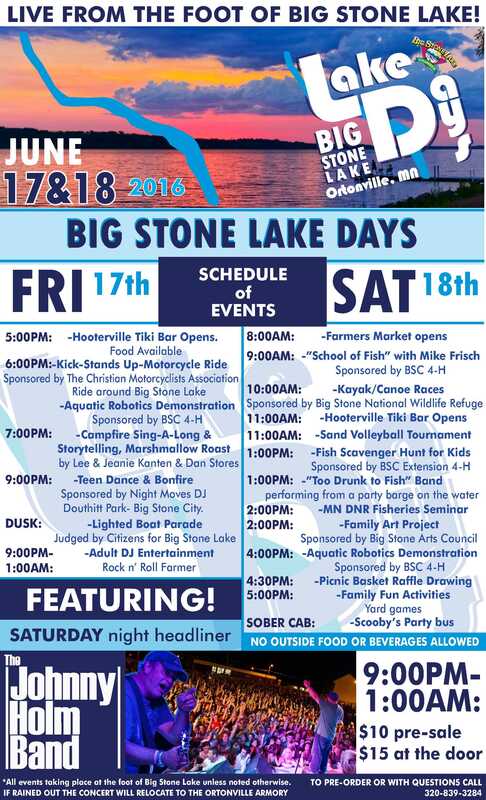 Make sure to check the Lake Days Flyer for all of today’s activities! LakeDaysCampfireSing from Vicki Oakes on Vimeo. Here is where you will find all news and updates related to the 78th Annual Cornfest, which is August 19 – 21, 2016! Watch for details to come…. Looking for event application click below. If you would like to donate towards Fireworks, click on the Sponsorship Application above, fill out the amount and write Fireworks on the form, then drop off or mail the form to the Big Stone Lake Area Chamber Office. Posted on March 3, 2016 by Ortonville DRC | Comments Off on Rural IS Our Opportunity! Santa (and the Mrs.) Claus is comin’ to Ortonville! The Claus’ will be in town December 5 for Santa Day! They will be at Lingonberry’s Pastry & Coffee Shop for pictures with the kiddos from 1 to 3 p.m.! They will also be riding in the Lighted Parade at 5 p.m.! Other activities include holiday arts & crafts, cookie decorating, an adult ugly sweater contest, hay rides and holiday movies! Stick around for the Lighted Parade and Avenue of Trees Lighting at 5 p.m.! Click here for a Santa Day poster! Click here for the Ugly Sweater Contest poster! Mark your calendar for our annual Cornfest Event – three days of fun for the whole family at Ortonville’s Lakeside Park!